Between Christmas and Titusville, the trail’s north entrance is located on SR 50, 3.2 miles east of the St. Johns River Bridge or 2.6 miles west of the I-95/SR 50 junction. The trail is across flat and poorly drained land. Most of the property has been cleared for cattle pasture except for the marsh and large hammock in the south portion. 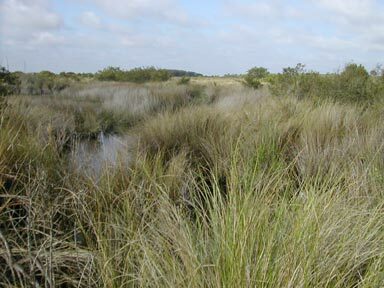 The Canaveral Marshes Trail is located on the St. Johns River floodplain and crosses primarily cattle pasture and some scattered live oak hammocks along the Canaveral Marshes Conservation Area. No hunting is allowed, and a varied assortment of wildlife may be seen, including wading birds, turkey, deer, osprey, eagles, alligator, armadillos, and wild feral pigs. The hammocks have pines, live oaks, palms, palmettos, wax myrtles and red cedar.Near the trail’s midpoint, it crosses the Ellison-Addison Canal. This canal is named after the two men who attempted to dig a waterway connecting the St. Johns River and the Indian River in the early 1900’s. Financial support for the project ran out when it became too expensive to dig through the rock on the east shore of the Indian River, so it was abandoned. The Canaveral Marshes Conservation Area is managed by the St. Johns River Water Management District. At the southern end, the trail circles an extensive Indian mound in a live oak hammock.